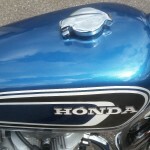 Restored 1976 Honda CB360 Motorcycle. The frame, swinging arm and battery box were bead blasted and resprayed in gloss black. 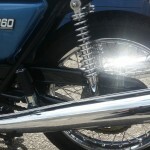 The original front forks were hard chromed and reground. 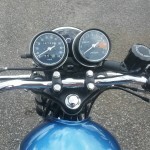 The front fork lowers were cleaned and polished. 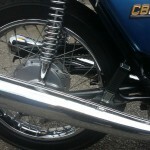 The rear mudguard was re-chromed. A new old stock rear light assembly was fitted. The brake master cylinder was rebuilt with new seals. The front caliper was overhauled and a new piston was fitted. A new front metal brake pipe was fitted. The front and rear wheel hubs were cleaned and polished. 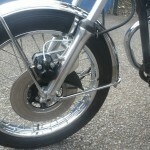 The front and rear wheel rims were re-chromed and laced with new spokes. 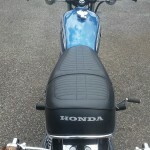 The side panels and a new old stock petrol tank were painted in Honda Hawaiian Blue. 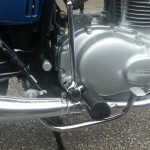 The rear brake lever and pedal were re-chromed. 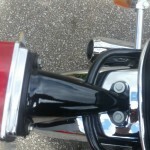 The gear lever was re-chromed. The seat base was bead blasted, repainted and a new cover was fitted. 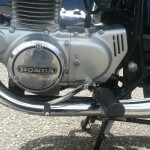 The original exhaust down pipes and silencers were re-chromed. The carburettors were ultrasonically cleaned and the tops were re-chromed. A lovely restored Honda CB360 Motorcycle. 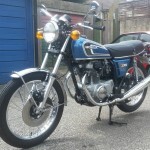 Honda CB360G5 – 1976 For Sale or Wanted? If you're looking for the perfect Honda CB360G5 – 1976 for sale then take a look at the hundreds of restored classic motorcycles listed on our extensive Motorcycles For Sale pages. 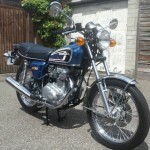 We regularly feature very nice restored Honda CB360G5 – 1976 bikes for sale. 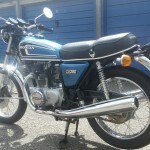 Spares and Parts for your Honda CB360G5 – 1976? Workshop Manual for your Honda CB360G5 – 1976?